Addicted to electronics, microcontroller, LED Dot Matrix, Led 7-Segment, PIC Digital Clock, Digital Watch, Led Dot Matrix Clock, Led Dot Matrix Watch, GPS and other DIY projects. Short notes about my PIC Microcontroller experiments sometimes it's just a short note sometimes it's a full PIC Microcontroller Project. 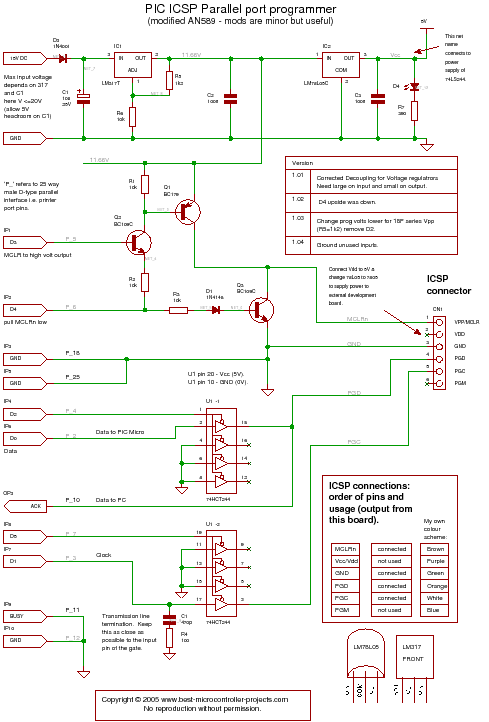 The information here including source code and schematic are available for FREE, please contact me if you want the source files of the schematics/PCBs. A pic programmer circuit based on AN589. It is really quite a simple circuit and its main objective is to provide ICSP connections to your pic microcontroller. Note: That the PGM signal is not provided - it's not really necessary anyway as you can turn off PGM mode by programming the chip. For first use of a chip you will need to pull the PGM line low as PGM is enabled by the manufacturer. Click on the following diagram to open it as a PDF document. Disclaimer : If you build this circuit you must double check each connection to the parallel port cable to avoid damage to your computer. This includes checking for shorts between each pin at the parallel port on your circuit. For initial testing it is best if you use a spare (old computer). Building this project is your own responsibility and I can not be held responsible for any damage to your computer. Transmission line termination - lets it work over a long cable. Power supply steering diode (stops you reverse connecting the supply). Changed LM340-5 to 3pin 100mA LM78L05. An LED to show that power is applied. Changed 74LS244 to 74HCT244 because I had one handy! Standard 10k resistors instead of 2k - just easier if they are all the same. The transmission line termination lets you use the pic programmer circuit at the end of a long cable - I am using a normal parallel cable ~6 feet long. If you want to know more about transmission line terminations then follow this link. When I first tried to use it I got all kinds of random results so it is worth adding the termination. The LM317 saves you needing an accurate bench power supply - you can use a dc power block - anything that supplies more than about 15V dc. If you don't use a 317 it's just too easy to accidentally apply the wrong voltage by turning the dial on a bench supply and frying your microchip. Using the 317 lets you put up to 35V into it (you shouldn't but you can). Note: the LM317 and LM78L05 are standard components and are easy to find. Following on from this is the 5 volt regulator which is only used to power the LS244 buffer. Its just not worth using a Zener diode supply as the actual voltage at the Zener varies with the load (it's voltage is only specified for a constant current through it) you then need a transistor to isolate the Zener so its just easier to use the three pin regulator. Note: The pin out of the LM78L05 is different to its larger counterpart the LM7805. The 5V regulator should be designed for the target board i.e. heatsinking etc. You could get more noise into your circuit. If you want to power your board from the programmer then change the 78L05 for a 7805 which can supply up to 1A but for higher current it will need a heatsink. The pic programmer circuit is a bit wasteful as it only uses two gates from the eight available in the LS244 but it's a cheap part anyway. Q1, Q2 and Q3 can be replaced with any standard general purpose transistors (two npn and one pnp). You can use ICPROG with this pic programmer circuit. It erases, programs and verifies your pic microcontrollers. ICPROG also controls resetting the microcontroller at the end of verify so after programming and verifying the program will start. ICPROG is a good choice for programming software as it has many programming algorithms for many devices (not just PIC microcontrollers) and it is FREE. It also specifically supports this type of pic programmer circuit i.e. the AN589 pic programmer circuit. Note: Double check the settings in ICPROG e.g. the HS setting for oscillator selection - otherwise you may find your microcontroller just sits there doing nothing!